April is well known as the most bullish month of the year. Let’s look a little deeper and study this perfect example of potential ways to use adverse market conditions to your advantage. Seasonality is important because it’s one of the ways you can get ahead of the curve by scheduling your investing time for maximum effectiveness. Seasonality analysis is something you do on a rolling basis several months in advance. You do NOT want to get caught behind and wait for the media to start hyping a seasonal trend when it’s too late to position and act. First thing we do is pull up a monthly chart and add the calendar event “April” to the chart. Drag it back to 1993 and it should look something like this. 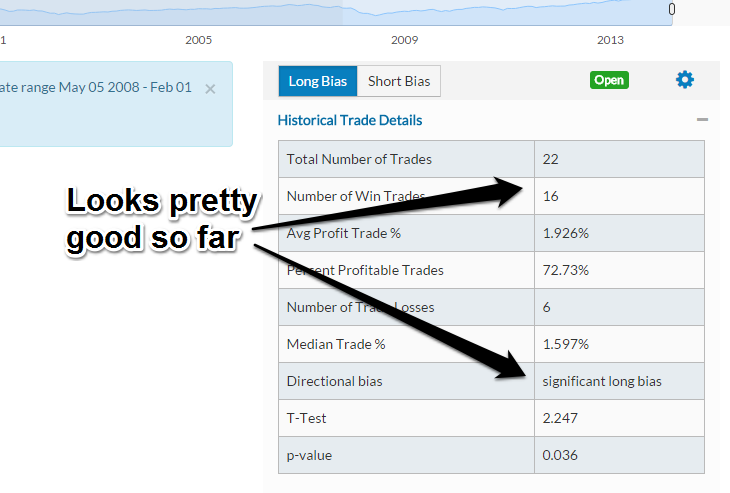 Run a quick analysis and it will let you know that April is historically a very good month for the bulls. By most standards, this is a very juicy setup. Where are the hidden risks? This is where the Alpha Curves really shine. To see the Alpha Curves we zoom in on the dates of our study. 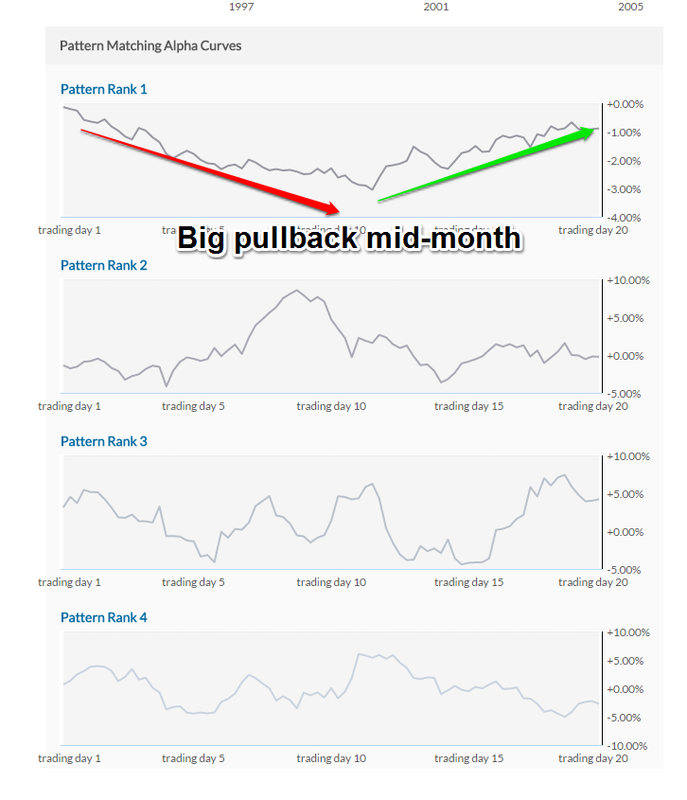 Look carefully and you will see the most dominant pattern is for a deep dip and then mid-month recovery. The Alpha Curves algorithm uncovered critical information. Although April is an overwhelmingly bullish month, the most dominant pattern we see in the data is that in recent years the market pulls back dramatically before going on to positive returns. This is a prime example of how you can have the odds stacked in your favor and still lose money…. unless of course, you were prepared for this! Take a look at the tails for each of the highlighted months of April in the monthly chart for proof — three of five have a lower candlestick tail larger than the body. The tail of the candle is formed by the intra-month pattern shown in the Alpha Curves. This is the pullback you can see in the Alpha Curves. Seems obvious when you look at it now, right? Also, notice that if there’s a big run up in the first week or two it might be all that April has to offer. Use this information to manage risk. So far we’ve connected what happens statistically. Let’s take it one step further. What happens in the United States every year in the middle of April? Could the dip in the market correlate with investors raising money (selling some portfolio winners) to pay their tax bill? No way to know for sure, but interesting correlation. 2. April has a tendency in recent years to have a selloff AND reversal inside of the same month. 3. There’s a FUNDAMENTAL reason we can connect to the patterns we’re seeing in the data. Are you feeling smarter yet? Can you see how this can make you a more informed investor? These anomalies can be a great opportunity. Always review the coming months in advance and look for behavioral clues in the data so you know what to expect. Trust me, it pays off.